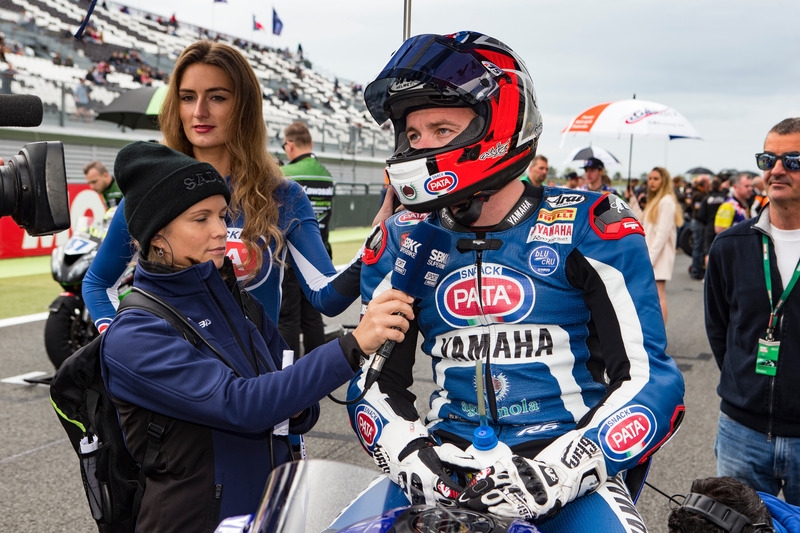 It was an incredibly dramatic race for the GRT Yamaha Official WorldSSP Team on Sunday in damp conditions at Magny-Cours, round ten of the 2017 FIM Supersport World Championship. Federico Caricasulo stormed to his third podium of the season after battling for the victory the entire race, crossing the line in second just 0.875s behind the winner. His teammate Lucas Mahias mounted a superb comeback after contact with another rider saw him down in 19th at the end of the first lap, with the local hero fighting back superbly to finish in an incredible fourth place and lead the championship standings by nine points. Caricasulo qualified in fourth but began Sunday’s race from third after an injury to Kenan Sofuoglu, with the Italian making up an all-Yamaha front row with Kallio Racing’s Niki Tuuli and Sheridan Morais. After a blistering start, the Italian rider found himself in a superb three-way battle for the win with Tuuli and Morais, with the lead changing hands numerous times. As the race progressed this turned into an incredible two-horse race between Caricasulo and Tuuli, with the riders swapping places at almost every corner as they fought each other on their Yamaha R6s. Neither rider could break away from the other until a small mistake by Caricasulo on lap 12 allowed Tuuli to open up a one-second gap at the front. The 21-year-old responded superbly and closed the gap once more, setting the fastest lap of the race in the process – a 1:42.185 – but, unfortunately, by doing so he used up what was left of his tyres and he could not maintain that pace during the last couple of laps, finishing the race in second, just 0.875s behind Tuuli after an excellent duel and securing his third podium of the season. It was Tuuli’s maiden WorldSSP victory and mean there were two Yamahas R6s on the podium for the fourth time this season. Caricasulo collected 20 points for his efforts and is now sixth in the championship standings with 80 points. Mahias arrived in Magny-Cours second in the championship, just four points behind Kenan Sofuoglu. Unfortunately, the local hero had a technical issue in SP2 on Saturday that meant he could only qualify in 12th and he was still feeling sore after his crash in a wet FP3. Sadly, his title rival Kenan Sofuoglu crashed during SP2 and was forced to withdraw from the weekend due to injury. This meant Mahias started from 11th on the grid. When the lights went out the 28-year-old enjoyed a good start but on the first lap but made contact with another rider, which forced Mahias to run wide and drop down to 19th place by the time they crossed the line for the first time. Unbelievably, this just seemed to spur the French rider on at his home round and he showed blistering pace to storm through the field, passing rider after rider in an incredible display of riding, bringing his Yamaha R6 home in fourth to a rapturous reception from the French fans. The 13 points Mahias secured means he now has a nine-point lead in the championship standings over Sofuoglu, with the Turkish rider recovering from surgery on his injured pelvis. The GRT Yamaha team would like to wish Kenan a speedy recovery and we hope to see him back on track as soon as possible. The GRT Yamaha Official WorldSSP Team are back in action at Jerez for round 11 of the 2017 FIM Supersport World Championship on the 20th-22nd of October, where Mahias will have a chance of clinching the title if results go his way. Check out the full race results from Sunday in Magny-Cours.